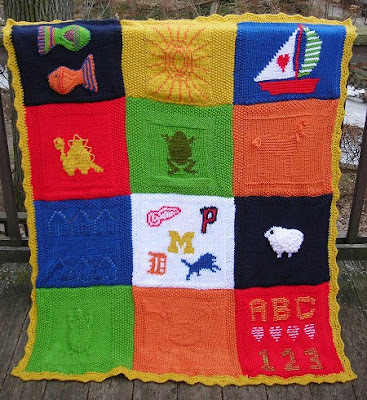 DetroitKnitter: Patchwork Baby Blanket finally done! Patchwork Baby Blanket finally done! Without looking back through my blog I'll pick up where I'd last left the knitted baby blanket project for my cousin. I had just taken it back after making a pre-gifting boo boo of sewing the edging inside the blanket then brought it home and unseamed everything. There it sat for over a month in this unfinished state until this week when I knew I'd better get on it with a bit of "Get R Done" motivation. I had contemplated trying to duplicate stitch the moon & stars square but let those thoughts slip by as I reminded myself that assembly would most likely take longer than my mind would like to think it takes. So I began on the assembly. I fussed with it for a while on the pool table using a sewing grid until I was disgusted with the fact that the sewing grid wasn't big enough. Ah-Ha! Use the ceramic kitchen floor as a grid! So about my business I went taping down the anti-pill fleece backing to the floor using the straight edges of the kitchen floor to square it up. Then laying the finished knitted blanket over top and squaring up the edges to fit within the fleece square I meticulously pinned the two pieces together at the edges. Attacking the middle grid I used a drywall T-square to attempt to straighten the lines that would be sewn down between each square and pinned those as well. I hand basted the edges so I could remove the pins so I could sew unobstructed and so I was sure the knit wouldn't bunch as I sewed the two together. SURPRISINGLY enough I had NO trouble sewing the two pieces together with the fleece side down while using my sewing machine using a regular zipper foot attachment. My first attempt at sewing this was while experimenting with my quilting attachment for this same machine. 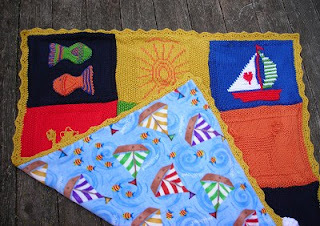 I used yellow and a zig-zag stitch for the edging then removed the basting stitches. I used a transparent nylon thread for the center grid which worked out really well since my lines weren't very straight! All in all it turned out to be a beautifully hand made blanket! Link to KnittingHelp.com forum where this is posted.